Your Digital Workplace is the perfect place to gather real business intelligence. With 1000’s of employees saving, creating, publishing, commenting or documents, forums and feeds every day, you have a constant stream of live data to analyse. Built in Matamo data will enable your information analysts to identify trends and patterns in your data to better understand your customers as well as employee engagement and the system transactions. This intelligence will provide insights into the business that can inform better decision making, communication strategies and productivity saving the organisation millions in efficiencies. Custom reports and graphs visually show you where your intranet is performing well, and what content is less popular than it might be. Using our extranet features your stakeholders, as well as your content publishers are able to track stats and KPIs, helping to inform your intranet strategy. We will work with you to ensure the Big Data infrastructure in Invotra works for your organisational needs, so that you have a responsive tool that is powerful enough to search and analyse the data when you need it. Use our analytics features to enable roll-outs of evidence-based improvements to your intranet navigation and content and Invotra will support your scaling and development at every stage. Content ratings – Measure the success of your intranet and the content within it. With our product you’re able to analyse which pieces of content on your intranet generate the most traffic. Analytics – Invotra comes with built-in analytics thanks to Matomo, the leading analytics system offering unparalleled security and rich reports. 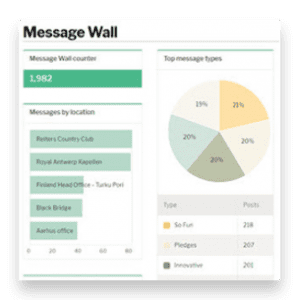 Custom reports and graphs visually show your information analysts where your intranet is performing well, and what content is less popular than it might be.